We're getting married Labor Day weekend 2013, and we would love to see you at our wedding! 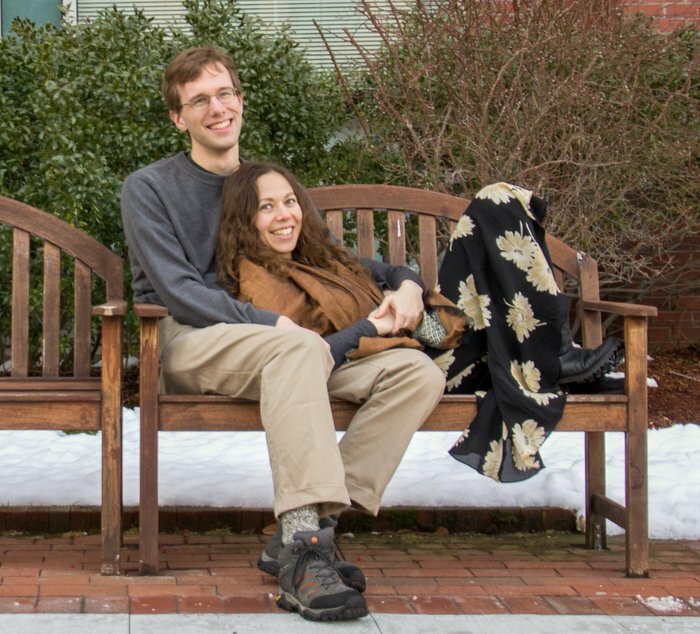 What: A weekend-long destination wedding in western Massachusetts, featuring swimming in the lake, board games, camp fires, hiking, etc. Camp Kinderland is a summer camp, founded in 1923 by Jewish activists as a retreat for their children from the tenements of New York City. After the summer ends, they rent out the camp for groups to enjoy all of their facilities. We are going to have the whole camp for the long weekend. It’s going to be lots of fun! 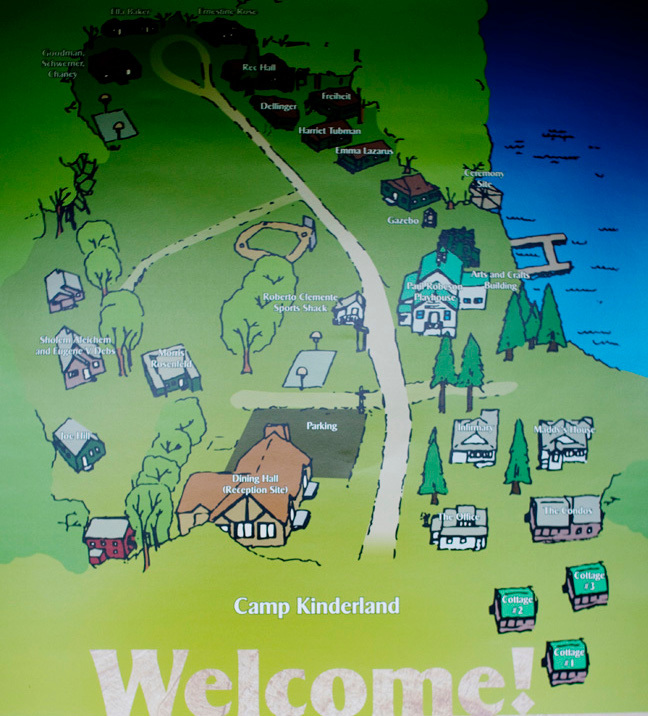 Camp Kinderland has great facilities, including a waterfront suitable for swimming and boats, trails, a rec hall, a big dining hall, two basketball courts, several large fields suitable for Ultimate, and a playhouse. We plan to make use of all of them for general hanging out and activities, and the ceremony and reception. Everyone is staying in the cabins at Camp Kinderland. The cabins are rustic buildings, but they all have electricity, bathrooms, and showers. Each couple will have an air bed, a full size mattress, or two twin size mattresses pushed together to sleep on, and each single adult have a twin size mattress. You will receive your room assignment when you arrive at the camp, and perhaps in an earlier e-mail as well. Couples will have their own rooms; individuals will be sharing a room with at most two other people of the same gender. Essentially everyone is lodged in cabins with their friends. Linens (including sheets and 2 towels per person) are provided by the camp. The cost of lodging is $175 per person for all three nights, or $75 per person per night for those who aren't staying for the whole weekend. Children under 18 stay for free. Lodging at the camp includes all meals. Boris Lipkin (Alya's brother) is managing lodging and handling payments. If the cost is at all a burden, we can definitely arrange a subsidized (or free) stay. Please get in touch with us if you have any concerns about the accommodations. Camp Kinderland staff will be providing meals and snacks throughout the weekend. They are aware of everyone's dietary restrictions, so we should be able to accommodate everyone's needs. The chef will be around to answer any questions you may have. However, if you are still concerned, you can bring some food, and store and prepare it in a small kitchen in the rec hall. Note that fridge space will be rather limited. We will provide beer, wine, and non-alcoholic beverages throughout the weekend. The reception food will be a buffet, so there's no need to decide which dish(es) you want ahead of time. Our caterer is aware of everyone's dietary restrictions. Cell phone reception at camp is flaky. There is wi-fi internet available at the office. The housing assignments are sorted by cabin, ordered counterclockwise from the bottom left corner of the map. Guests will decide who gets which half of the cabin when they arrive. We have some specific room assignments in mind, but they're hard to describe. We'll let you know about the exact room assignments on-site. The map below should help you get a sense of the layout of the camp's building complex. Wedding guests will be staying in both the counselor and camper parts of the the cabins in the north and west ends of camp, as well as the staff housing in the southeast corner. The cabins are surrounded by over 100 acres of woods, and the lake is entirely on camp grounds. We also have a black and white map of the camp that shows some things better and other things less well. Board games/card games/party games! We're expecting there to be lots of board games played at the weekend. We recommend labeling your games (e.g. by putting a slip with your name inside the box, if you don't want to write on the game directly), to make it easier for everyone to retrieve their copy of Dominion, etc. a the end of the weekend. We've created a spreadsheet tracking who is packing what games to help those travelling across the country plan what games to bring. Anything you think would be fun at a campfire. Any sporting equipment you want to bring. The camp has a shed full of random gear, and we're bringing at least a half dozen good Frisbees, but if there's some unique activity you want to do, feel free to bring the gear for it! We're bringing birdies for badminton -- bring your racket! Any water sport/game equipment you want to bring, e.g. beach balls. The camp has paddleboats, canoes, life jackets, noodles and an impressive dock system with several floats to visit and a nice roped off area that could be the playing area for a water sport. Movies you (or someone else) might want to watch. We'll be able to project DVDs on a big screen in the playhouse. Any video games you're excited to play in addition to the Rock Band party we have planned. Any other entertainment equipment that you think would be fun (e.g. extra-awesome boffing weapons (regular ones will be provided), juggling balls, blinky lights, ....?). A good flashlight. The cabins have lights, but it's the wilderness, and there are no lights outside. Your camera. We'll be hiring a professional photographer for part of the day on Sunday (i.e. for the ceremony and the time around it), but we're hoping everyone will take lots of pictures throughout the weekend. Insect repellent. The wedding is at a New England camp by the lake -- there will be lots of mosquitoes, especially at dusk. Soap, shampoo, etc. (not provided). Note that the camp provides sheets, pillows and 2 towels per person. Warmer clothing for the evenings. Clothes & shoes appropriate for sports (e.g. ultimate frisbee, capture-the-flag, etc. ), ideally including a light shirt & dark shirt. Hiking boots. The hiking trails may be muddy; also for the Monday hike, if you're planning on going. Attire for the wedding ceremony. 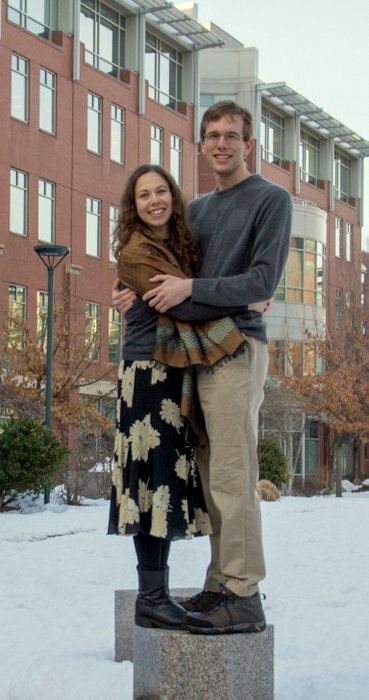 Alya and Tim will be dressed formally for the wedding ceremony, and we expect that most people will choose to dress up, but what you wear is completely up to you. Some guests may choose to wear math t-shirts, for instance. Dancing attire. This should be different from your wedding ceremony attire, as we will have a live band the night *before* the wedding. Q: Is there a gift registry? A: Your presence at our wedding is a wonderful present in itself. So please just come, hang out for the weekend, and don't get us anything! If you really feel that you'd like to give something, please make a contribution through our charity registry. Q: Who is in the wedding party? A: We do not have an official wedding party. A: See the Packing page. The only relatively formal occasion will be the wedding ceremony/reception; the ceremony will take place outdoors. A: Unfortunately, the camp does not allow pets. We appreciate the many generous offers of help we've received from our friends and families. 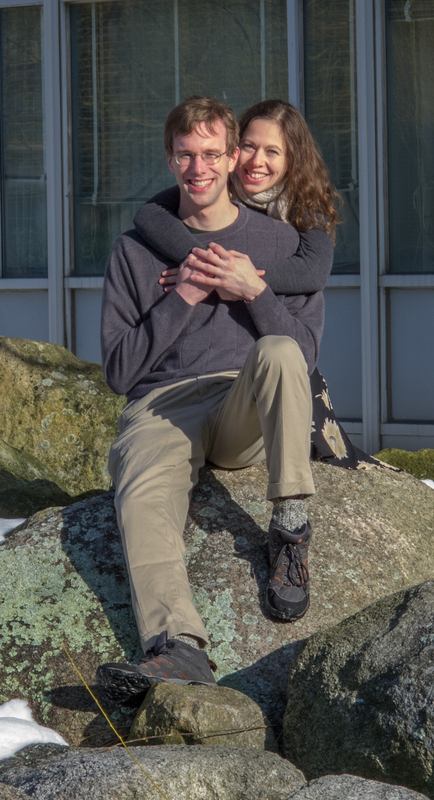 Our apologies if we accidentally leave someone out, or don't have a chance to mention your help here until after the wedding! Thanks to Naomi Muscatine for providing advice and moral support during a 4-hour wedding dress shopping trip. Thanks to Boris Lipkin for organizing payments. Information about Camp Kinderland was ruthlessly copied from another Kinderland wedding website. Thanks to the anonymous weddingbee poster who posted an exhaustive list of northeast outdoorsy wedding venues through which we found Camp Kinderland. Thanks to Chris Abbott for finding us a band! Thanks to Katya Prupis for finding us a photographer. Thanks to Lanthe Chronis, Jeff Cohen and Random Hall for help with liquid nitrogen ice cream. Thanks to Olga Simek for taking care of flowers for the wedding. Thanks to Debby Abbott for agreeing to officiate our ceremony, and putting lots of thought into it. Please keep in mind that this schedule is definitely not meant to be exclusive, and we hope and expect that people will come up with other fun stuff to do at the weekend. If you have an idea for an activity you're excited about, let us know, and we can add it to the "official" schedule. 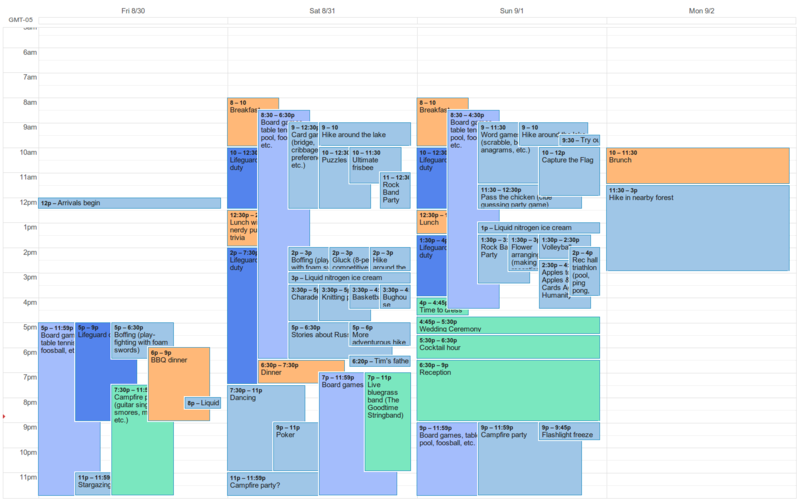 The nicest way to view the schedule is to add it to your Google Calendar. You can do this by using 6npq4bjteqldf06iqq3teoc57o@group.calendar.google.com as your friend's email address in the "Other Calendars" section on the left sidebar. We've found that Google Calendar's "4 Days" view is great for viewing the schedule. We will give you a printout of the schedule as part of your packet when you arrive at the camp. You can view the embedded Google calendar widget below. You can click on the nicely colored screenshot at the bottom of this page. The wedding location is between 2 hrs 15 min and 2 hrs 45 min away from each of the Boston, Providence and New York area airports. (Boston and Providence are a little closer than New York.) The closest airport is Hartford, about a 45 minute drive away. We are coordinating carpooling via a Google spreadsheet, with one sheet for each direction of travel. If you have a car and can offer rides, please indicate so in the top section of the spreadsheet. If you're looking for a ride, feel free contact the driver for one of the cars with available space. If none of the options work for you, please indicate your travel info on the bottom half of the spreadsheet. You can then contact people with compatible plans to organize car rentals/carpools. The address of the camp is 1543 Colebrook River Road Tolland, MA 01034. It's pretty easy to get there using Google Maps Navigation, with the exception of the fact Google Maps doesn't know the street address for Camp Kinderland if you look it up by name. If you do that, Google Maps Navigation will tell you "You have arrived!" when you're a mile or two down the road from the camp. There's a big sign at the entrance to the camp (on Colebrook River Road), so it's pretty hard to drive past it without noticing it. Please note that there are no gas stations particularly near the camp, so if you’re running low, we recommend filling up as you're passing through Westfield, Great Barrington, or Winsted (depending on the direction you're coming from). Finally, if you get lost, call the camp's landline at (413) 258-4463 or one of our phone numbers from the Contact page. The parking area at the end of the camp driveway will be clearly indicated. You'll get your room assignment, along with a map of the camp and other information, when you check in with our greeters at the Camp Office. Driving into the camp is strongly discouraged, but you can drive up to your cabin to drop off your things if you need to. If you do, please leave your car in the parking area afterwards.